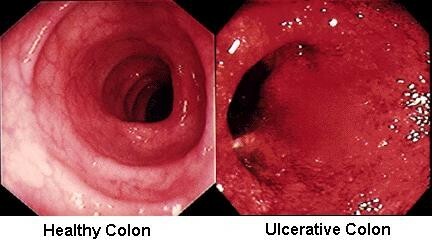 A chronic disease of large intestine in which the lining of the intestine is inflammated. It develops open sores, or ulcers, that produce pus and mucous. It is unknown. Stress was thought to cause it but it is now known that it just irritates it. It is more common in people with relatives that have it. One possible cause is an immune system malfunction. Medication such as prescription steroids or self treatment such as Tylenol. Surgery or colonostomy is also an option.